[Click here if you’ve landed here looking for our Primary School Resource Pack]. Bilbo Baggins bets his life on a riddle in The Hobbit. Fortunately, for the story he doesn’t lose (or else the dwarves would never have kept their appointment with Smaug!). That riddling competition takes place in a dank deserted cave under the Misty Mountains…all very lonely and sinister…but riddles are mostly rooted in a far more homely place. A bicycle can’t stand on its own because it is two-tired. Show me a piano falling down a mineshaft and I’ll show you A-flat minor. In Anglo-Saxon times very few people could read, so the riddles relied on sound-alike words. The riddles would be learned by heart and performed in public, sometimes with musical accompaniment (a bit like Cracked Voices). Luckily for the author of The Hobbit, around 975 AD some of the riddles were eventually written down, probably by a monk. 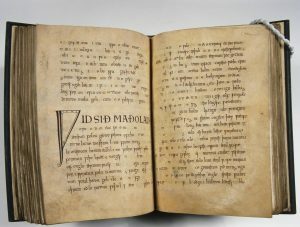 The Exeter Book is the largest surviving collection of Anglo-Saxon riddles in the world and provides the first recorded use of the term ‘Middle Earth’. The answer to these two of Tolkien’s puzzles are or course wind and time. When writing about the Anglo-Saxon origins of Therfield Heath (a puzzle in itself) for Cracked Voices, it seemed right to base the song on a riddle, so I set about writing my own. I am the cup that spills sorrow and joy. mine is the fateful summoning voice. no fruit in the Garden so readily peels. [Scroll to the bottom of the page to find the answer]. Think of your favourite object…the thing you couldn’t live without. Think of its function: What makes it special? Why’s it important? What does it do? What’s it similar to? Think with your five senses: What does the object look like? What does it feel like? Does it smell of anything? Does it taste of anything? Does it make a noise? Think of your friends and family. Who is your object most like? Why? is it because they have the same emotional connection, do something similar or look alike? Set yourself three minutes ONLY to scribble down your random thoughts and phrases without analysing them or changing any of them. Read what you’ve written and then salvage the best one or two lines as the start of your riddle. Leave it a day or two. Then return to the riddle and expand on it by answering more of the questions in (2), (3) and (4). Post your riddle on Cracked Voices, so others can guess it! For slightly more in depth advice from the Poetry Society on writing riddles click here. This entry was posted in Blog and tagged Anglo-Saxons, Bilbo Baggins, Cracked Voices, Exeter Book, Gollum, Middle Earth, Riddle the first, riddles, Therfield, Therfield Heath, time, Tolkien, Wind on December 27, 2017 by Graham Palmer.